UNCF-member institute Morris College celebrated the inauguration of its 10th president, Dr. Leroy Staggers on April 12 in the Neal-Jones Auditorium on the Morris campus. Several notable individuals were present during the event. Sumter Mayor, the Honorable Joseph T. McElveen, Jr.; South Carolina Senate District 35 the Hon. J. Thomas McElveen, III; Sumter County Chairman the Hon. James T. McCain and Claflin University President Dr. Henry N. Tisdale brought greetings, followed by faculty and staff, alumni, and the Student Government Association President. UNCF President and CEO Dr. Michael L. Lomax gave the Presidential Charge. “Today, as we join in the inauguration of our new president of Morris College, our friend and colleague Leroy Staggers, we can be thankful that he is no newcomer to Morris College but, instead, a seasoned leader who knows the college well and has been prepared over his twenty-five years of service here to lead in times such as these,” said Dr. Lomax. By unanimous decision, the Morris College Board of Trustees named Dr. Leroy Staggers President Elect until July 1, 2018. 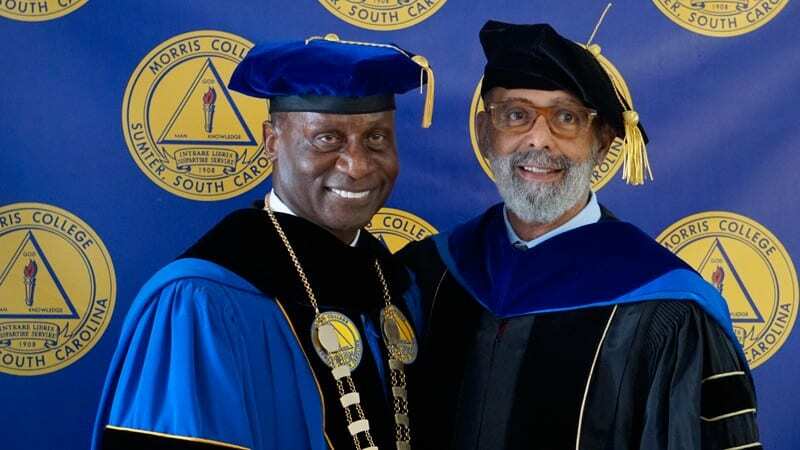 The board of trustees identified a Presidential Search Committee and initiated a search for a permanent president in May of 2017 following the late Dr. Luns C. Richardson’s retirement after 43 years of devoted leadership. Dr. Leroy Staggers served as Interim President from July 1, 2017 to present. Dr. Staggers’ passion for students’ intellectual growth has provided dedicated service to Morris College for roughly 24 years. Most recently, he has served 16 years as the institution’s Academic Dean, responsible for the supervision of all academic programs, all full-time and part-time faculty members as well as all academic support instructional programs. He worked very closely with Dr. Richardson on all aspects of Morris College’s reaffirmation of accreditation efforts. Before joining the Morris College family, he served as Vice President of Academic Affairs, Associate Professor of English, and Director of Faculty Development for Barber-Scotia College in Concord, NC. Additionally, he has served as Instructor of English and Reading at Alabama State University in Montgomery, AL, and Chairman of the Division of Humanities and Assistant Professor of English at Voorhees College in Denmark, SC.